London's FTSE 100 index has recorded its biggest weekly loss this year after poor manufacturing figures in China exacerbated global economic fears. The FTSE has fallen 5.2%, or 363 points, since Monday. On Friday the index closed 2.8% lower, while markets in Paris and Frankfurt saw falls of about 3%. Shares also plunged on Wall Street, with the Dow Jones, Nasdaq and S&P 500 indexes all down more than 3% by the close. Only one company on the FTSE 100 saw gains on Friday - Royal Mail, which rose by 1.6%. 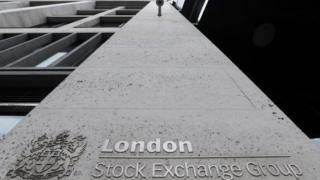 The FTSE 100 has fallen for nine sessions in a row, its longest losing streak since 2011. It is almost 13% below an all-time high hit in April. In the US, the S&P 500 suffered its biggest daily percentage drop in nearly four years on Friday, losing 64.8 points, or 3.19%, to 1,970.89. The Dow Jones industrial average fell 3.12%, and the Nasdaq dropped 3.52%. Karishma Vaswani: deja-vu for emerging markets? The private Caixin/Markit manufacturing purchasing managers' index (PMI) dropped to 47.1 from 47.8 in July. A figure below 50 indicates contraction. The data triggered another sell-off in Chinese shares, which ended the day down more than 4%. The decline comes on the heels of weaker-than-expected economic data in July, plus this month's yuan devaluation and a stock market plunge. Investors are growing increasingly concerned, as the Shanghai Composite index is now down 12% this week. Friday's factory output reading for China was the lowest since March 2009, during the depths of the global financial crisis, and the sixth consecutive below the 50-point level. Earlier in August, China's official economic growth data showed a further slowdown in the past quarter, expanding 7% compared with a year earlier, its slowest pace since 2009. In 2014, China's economy grew at its slowest pace since 1990. It expanded by 7.4%, missing its annual growth target of 7.5% for the first time in 15 years. Media captionThe BBC's economics editor Robert Peston examines the prospects for the world's economy. Nicholas Teo, market analyst with CMC markets, warned that China's slumping economy could dash hopes for a global recovery. "China today is no longer just the 'factory' of the world. It is an important consumer of the world's products and services. Many companies and industries depend on the Chinese consumers who are now 'disadvantaged' in purchasing power," he said. "So when it sneezes', many around the globe may just catch a cold." Greater China economist Julia Wang at HSBC warned that economic recovery continued to lose momentum with "further policy-easing measures, from monetary easing to fiscal support needed". AMP Capital's chief economist Shane Oliver described the situation as a "global share market correction", pointing out that emerging markets were "arguably much stronger than in 1997-98, with stronger current account balances and higher foreign exchange reserves". Beijing has struggled to stabilise the country's stock markets, which have fallen sharply since mid-June. Earlier this month, the central bank stunned global markets by taking steps to devalue the country's currency, the yuan, allowing it more freedom to fluctuate in line with market developments. The move was widely seen as an attempt to prop up the country's ailing export sector, making Chinese goods cheaper abroad.